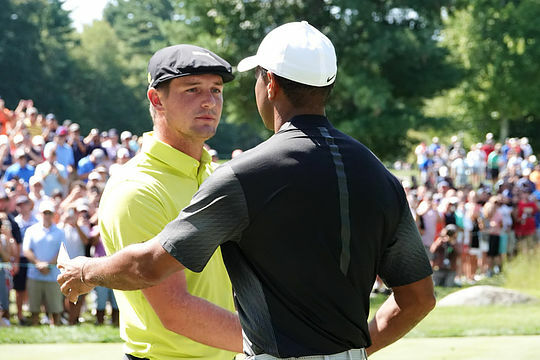 (TPC Boston, MA) Tiger Woods sounded a ringing endorsement of Bryson DeChambeau’s Ryder Cup ‘wildcard’ credentials after the player, who is some 17-years Woods’ junior, brilliantly upstaged the 14-time Major winner on day three of the Dell Technologies Championship in Boston. DeChambeau, who turns 25 on September 16th, stormed into the clubhouse lead finishing birdie, birdie and then landed his 237-yard second shot at the par-5 18th to within just two feet for a tap-in eagle in a round of 63 for a 12-under par tally. DeChambeua will head into the final round one stroke behind surprise leader Mexico’s Abraham Ancer while Australia’s Cameron Smith continued his superb recent form to at sit at 11-under alongside Justin Rose in equal 4th place. Woods and his fellow Californian-born DeChambeau teed-off sharing 21st place at five-under par but with this year’s double Tour winning Chambeau soon showing Woods a clean pair of heals in birdieing his opening two holes. DeChambeau then birdied the sixth and seventh holes ahead of seven pars before sinking a fifth birdie at 14 before dropping a shot on 15 and finishing his closing three holes in four-under. Admitting to some early nerves, the USA Ryder Cup rookie-elect was clearly comfortable in the company of Woods and could be observed often quizzing Woods throughout the 18 holes. Woods afterwards was full of praise for DeChambeau. “Bryson was fantastic to play with,” said Woods. Woods was asked to comment on DeChambeau’s remark that if Woods and DeChambeau were to each make the USA Team, the pair could easily intimidate thier European rivals. “If he goes around and shoots 8-under par every time, that will work,” Woods said smiling.